Then Jacob asked, saying, ‘Tell me Your name, I pray.’ And He said, ‘Why is it that you ask about My name?’ And He blessed him there. And Jacob called the name of the place Peniel: ‘For I have seen God face to face, and my life is preserved.’” Genesis 32: 24-30. We often “wrestle” most violently when we’re alone with our thoughts and our restless minds. At times like these, in the brilliant light of our own heaven or the miserable darkness of our personal hell, we struggle with the concepts of right / wrong, good / evil. At such lonely times, we hope the voice speaking loudest to us is that of an angel from God and not a demon from Satan. “And when the time came to give birth, Rebekah discovered that she did indeed have twins. The first one was very red at birth and covered with thick hair like a fur coat. So they named him Esau. Then the other twin was born with his hand grasping Esau’s heel. So they named him Jacob.” Genesis 25: 24-26. 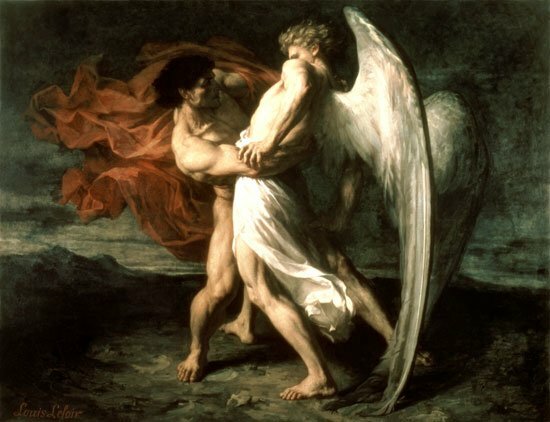 At the time of his conflict with the angel, he was attempting to reconnect with his brother after an absence of several years. Fear dominated the mind of Jacob, the trickster who robbed Esau of his birthright. He had every reason to believe that Essau would avenge himself. And just as Jacob was “left by himself,” the angel shows up and they begin their famous tussle. We learn Jacob is persistent if nothing else. He refused to yield to the angel and fought him throughout the night. 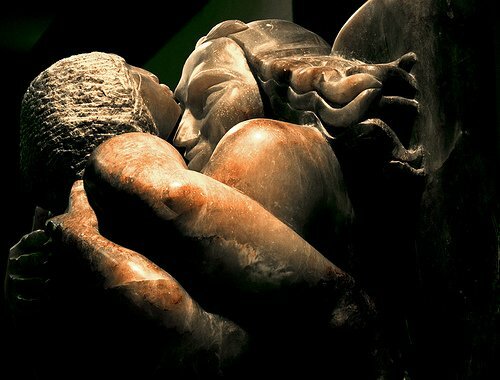 The angel “touched” Jacob’s hip and caused him to limp for the rest of his life – a visible, physical affliction that would remind Jacob that his persistence won the battle. We’re big fans of superheroes, growing up as we did surrounded by comic books and Saturday morning cartoons featuring some of our favorites. As kids, we knew everything there was to know about the heroes – strengths, weaknesses, friends, arch-enemies, etc. We knew they fought for justice and goodness, but there was one question we never thought about until we grew older and supposedly wiser: why do the superheroes most always do the right things? A normal person walking down the street sees a car crash into the ditch. When the automobile immediately bursts into flames, the pedestrian jumps into action to save the person trapped within the vehicle. Why do people do such? Why do people risk life and limb to save a stranger? Are we guided by voices from our personal angels? – Jacob wrestled with an angel, just as we wrestle with angels and demons in spiritual warfare. – Jacob’s determination in wrestling the angel represents persistence in prayer – a habit we all would do well to cultivate. – The wrestling with God’s angel represents the relationship between God and His children: a cosmic wrestling match – an endless cycle of sin and repentance. – The wrestling with God’s angel points to Jesus Christ, who often showed Himself in the pages of the Old Testament as the Angel of the Covenant – a divine creature who appeared on occasions to hint at His physical appearance made manifest in the pages of the New Testament. Thanks for your post. It’s wonderful to have this collection of art in one place! 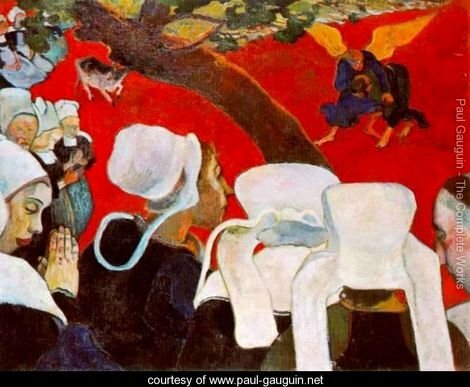 Scripture as uncanny power to speak to each of us on its own, over centuries and continents, and into our personal and “inner” lives in fresh ways– the same story sometimes having new meaning. 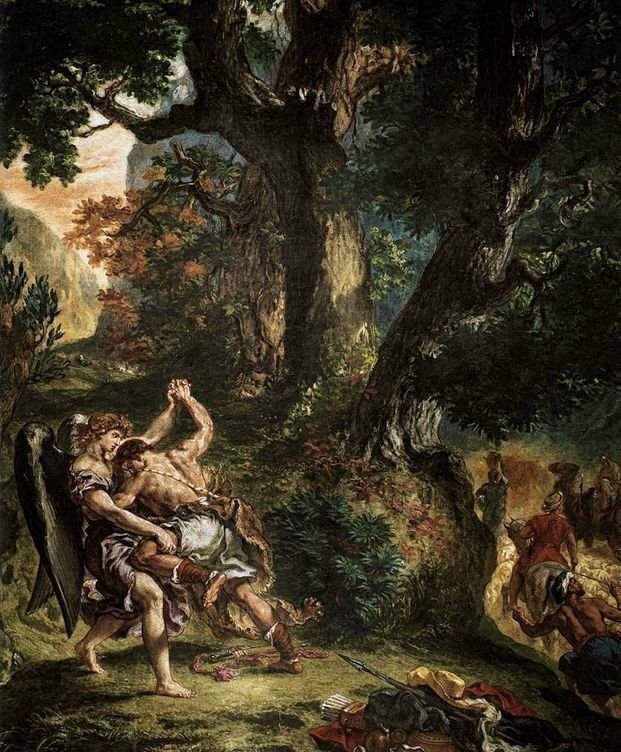 One very Hebrew interpretation, for example, which is especially brought out in the first painting you reference here, is that Jacob is trying to hold on to a God who resists being captured, controlled or fully known by humans. Thus, the failure of the Temple to house God like a bird in a gilded cage, and of death to hold Christ in the tomb. We can throw our frustrations at God– and God will mercifully absorb our blows without destroying us in retaliation– but God cannot be our possession and remain God. What is so beautiful to me is that God welcomes and participates in this kind of insubordinate interaction with our tiny species, because God’s love is so great. There are many different wonderful lessons to be taken from these ancient stories. Let’s not nail the book shut. Very well put. Perhaps we should reword it to say, “I think we could look at Jacob’s story this way…” Thanks for your input. Wow, beautiful and inspiring interpretation.